Reserve your Birthday Party space early. Parties are held on Saturdays from 1:30 to 3:15pm. Only paid reservations. The more the merrier. We allow up to 30 invitations. Stadium seating is available for parents if they would like to stay. White Tiger will provide an Olympic level martial arts demonstration by the Taekwondo Masters and a performance from Team White Tiger - children’s demonstration team. The show includes traditional forms, board breaking and movie style self defense techniques. 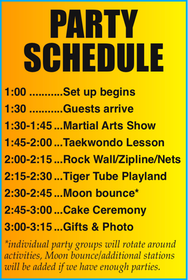 Guests will learn how to use “Eye Focus”, “Body Focus” and “Mind Focus ” in a basic Taekwondo trial lesson. Guests may enjoy the rock climbing wall and cargo nets. Disco party strobes light the way for a wild ride down the zipline. The next stop is the custom designed Tiger Tube playland system. Guests may play with a variety of toys and games or climb up into the Tiger and get a view from the eye of the Tiger. Continue the adventure with a ride down the 20 foot spiral slide. Parents may follow along and watch the kids from the suspended platform. In the Koi pond cafe, under the bamboo trees, guests will enjoy some Birthday treats. We will assist the Birthday child in cutting the cake with the samurai sword. White Tiger staff will serve the guests and handle clean up. Parents can relax and enjoy the party. After cake, there will be time for opening gifts and spending time with friends. If you supplied goodie bags for your guests, they will be placed with your gift table. Before you go, we’ll have everyone pose together for the group photo. 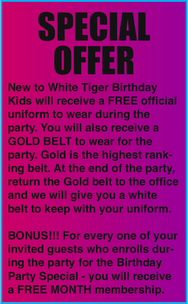 • Information to White Tiger so we may make your invites. Invite up to 30. • Cake, candles & drinks, ice cream cups? 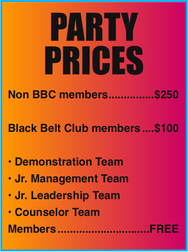 • Parties are very popular, book in advance to secure date. • Only paid reservations will be taken. 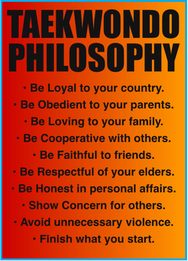 • No martial arts experience is required, techniques will be basic and age appropriate. For ages 5-12 only. • Individual drink boxes and ice cream cups are easier than pouring and scooping. • Time allowance for cake/ice cream only. There is NOT enough time to eat a meal. Do not bring food. Time for 1 cake only. Parties with food are held at different times at a different rate. • Private parties with food/band/entertainment are available at a different rate - Friday & Saturday evenings, Sunday afternoons, weekday daytimes. Call for more information & to reserve space. • Cakes in a pan cannot be cut with a samurai sword. • Bring a cooler if you need to keep things cold. We cannot provide a freezer. • We will supply a lighter for the candles, garbage bags and cleaning supplies. • We will e-mail thank yous after the party that usually include a group photo of the party. • Be sure to include the birthday child’s name and email on the permission form to receive the birthday photo! • Existing White Tiger students may participate in the demonstration during their party. Arrive at 1:00 to practice. • We will offer a special training package for all guests during the party. • Party is for one Birthday person only - no split parties. Call for exceptions and regulations. • Due to staffing and scheduling, we do not offer cancellations or date changes.